Let’s begin with what Sunrise City is not. First and foremost, Sunrise City is NOT Alien Frontiers. If the name Clever Mojo rings a bell, it is most likely because you were lucky enough to be a backer of their first Kickstarter project. The awesome dice-rolling frenzy that is Alien Frontiers can arguably be called the game that solidified the union between Kickstarter and board game publishing. And whether you think Alien Frontiers is the darling of 2010—I do—or not, don’t judge Sunrise City by its predecessor. 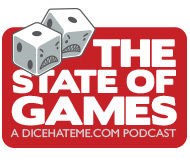 Sunrise City tosses the dice out the window in favor of much quieter game mechanisms. Opening the box you find more with an assortment of tiles and bits. There are two sets of tiles in the box: Zone tiles and Building tiles. The Zone tiles are square, and after laying down City Hall, each of the players will begin by zoning with them. There are 5 types of Zone tiles, and these, distinguished by color, correspond to the buildings yet to be lain. In addition to regular Zone tiles, there are a number of Community tiles. The player who lays a Community tile gets to immediately add another Zone from the remaining stacks. The Building tiles are rectangular in shape, with blunted corners. (They are actually reminiscent of the paper in the updated version of Battlestar Galactica.) If you thought the Zone tiles were thick, watch out: the building tiles are equivalent to two Zone tiles. Most of these tiles are divided in two, with each half color-corresponding to a Zoning tile onto which it will be played. The rest of the pieces in the box cannot be properly called bits. Bits are small, and these are the opposite of that. Sunrise City’s bidding chips are thick and chunky and boldly colored with matching scoring pawns. The Floor markers are black and shaped for easy handling as you move them on and off the board to denote floor levels. And the Benchmark tokens are thick, chunky gold stars. I’ll not forget to mention the scoreboard, boldly colored and of the same thickness as the Zone tiles. Lastly there are the Role cards, white with white borders, bold central figures, and clean, clear text. Yet another subtlety I only just picked up while writing this: the background of the Role cards corresponds to the Phase in which the Role activates (blue for Zoning, green for Bidding, and yellow for Construction). The exception to this is the Re-elected Socialite, whose power is to assume another Role. Her role is flexible, which dovetails beautifully with the other purple Zones and Buildings, whose hallmark is their flexibility! In terms of components, the quality is second to none. All of the tiles are thick and sturdy. All of the pieces are thick for fat-fingered players like me. And the Role cards will stand up to a good amount of shuffling. 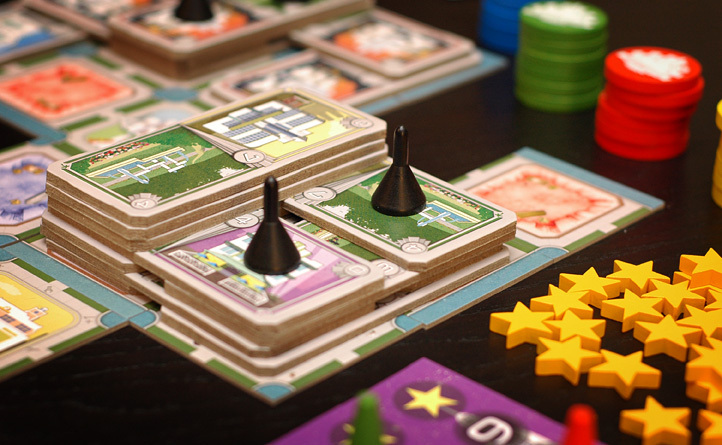 Sunrise City is one of those games that really benefits from repeated play. On your first play you see how to put together Zones, perhaps to create districts, and in ways that correspond to your Building tiles. 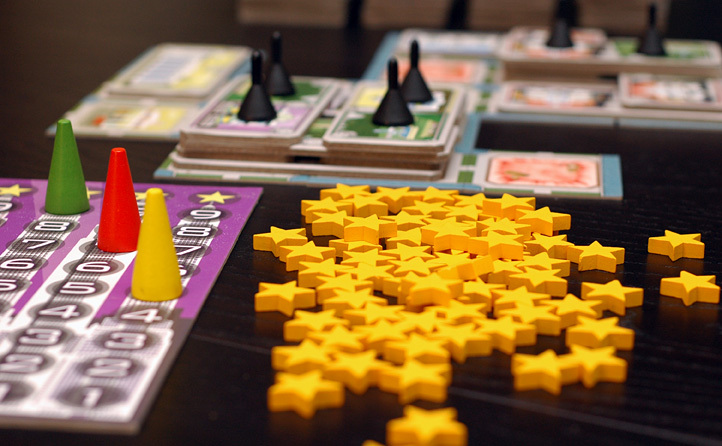 Lay down those Building tiles and score points. Well, in this game, it’s not just points that matter. Every time you score points you move your pawn up a track, numbered 1-10. The 10 is represented by a *star*. When your pawn reaches the top of the track, you wrap back around to the bottom, and score a Benchmark token for passing the *star*. However, if you land on the *star*, you score two Benchmark tokens. So the real trick to the game is not just to score points as fast and as furiously as possible, but to score in specific ways that land you on the *star* and earn that extra Benchmark. It is in managing this that the game is won or lost. Lest I be considered a shill, I want to end this review by pointing out two problems with Sunrise City. Fortunately neither of these problems is with the gameplay itself. In fact, both have to do with the coloring. First, the blue on the Zone tiles does not match the blue on the Building tiles. The larger issue with the blue is that it might be confused with the purple Zone tile, but laid side by side, the difference is obvious. This is a minor detail, and one that my mind overlooked shortly after recognizing the inconsistency, but that might pose an issue for some sticklers. The other problem of greater weight is the Community tiles. Community tiles have a significant effect on gameplay, and a tile placement that might land you directly on the *star* might be completely derailed by lack of consideration of those Community tiles. 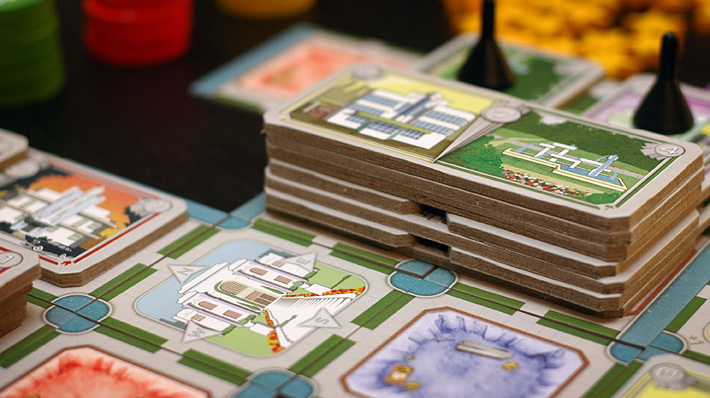 The background color on the Community tiles is intended to correspond to a type of Building, thereby gaining or costing points to the player who lays a Building tile next to it. However, the overall coloring of the Community tiles is so subtle, it is easy to forget they are there, and subsequently forget to score them altogether. I plan to solve this problem by buying color-corresponding glass tiles to sit on the Community tiles. These should stand out boldly enough not to be overlooked. If laying tiles is your thing, then Sunrise City will be a walk through the streets of heaven. Even if it is not, Sunrise City offers a combination of strategy and luck that will keep players coming back. Win or lose, any game that ends with me thinking about what I would do different next time is one to which I will return. Then you could tell me if they were similar because my wife LOVES city building, especially with no combat. If I could bring that to the table along with an auction like structure I think she’d be set. I’m sorry to say I have not played Vegas Showdown. It is a 2-4 player game. You did not miss it–I totally forgot to say it.